﻿Wendy J. Johnson began her career as a freelance logo designer. After receiving a BA in Fine Arts from Gustavus Adolphus College, she completed additional design and media courses at the Minneapolis College of Art and Design. Her subsequent design experience includes all aspects of graphic design, art direction/printing coordination, photography, and film/video production. Wendy has produced design for thousands of projects, including: logos; letterhead and identity materials; newsletters; booklets; manuals; books; curriculums; annual reports; brochures; slides; overhead transparencies; videos; posters; buttons; banners; flyers; forms; newspapers; advertisements; envelopes; product display cases; signage; museum wall displays; conference booths; and the web. For 10 years, Wendy was employed by the State of Minnesota, rising through the ranks from Graphic Designer to an Art Director position. Her principal responsibility was to manage, produce, and coordinate design and printing for public information projects. Wendy left the State of Minnesota to become President of Points Of View Incorporated. She is a co-partner of this entity with her husband, James V. Gambone, a video producer and intergenerational consultant. She coordinates all aspects of design production for her clients—from inception to delivery. Wendy also designs multi-media materials, including web pages. Search Institute, Augsburg College, MN Senior Federation, Free Spirit Press, 3M, MedicalCV Inc., Salolampi Foundation, Finlandia Foundation, MN Gerontological Society, PTM Group, CLIMB Theatre, The ReFirement Group, ISFN Group, Ackman-Baer Commercial Realty, Visions Inc.
With a passion for all textile arts, Wendy has created a fiber arts design business, Saga Hill Designs/Studio, that uses her talents as an instructor, designer, writer, textile photographer, professional dyer, and spinner. As part of Saga Hill, she has created her own line of fiber dyes, the Minnesota Series Dyes™, which she uses in her handpainted fibers and silks, and offers for sale at SagaHill.com. 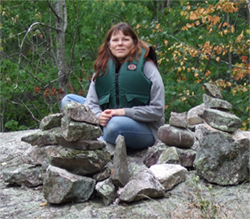 Wendy is also an award-winning installation artist (1 in 10,000 and Earthly Coat – Minnesota Landscape Arboretum). Wendy volunteers her fiber and design expertise at Gale Woods Farm, a Three River Parks District educational working farm. She also teaches a variety of fiber arts classes and has created an exclusive line of dyed yarns for Gale Woods Farm. Wendy is also a contract teacher at the Weavers' Guild of Minnesota. In addition, she shares her love of Swedish fiber heritage by occasionally teaching Swedish knitting techniques at a long-revered nordic shop in Minneapolis (Ingebretsen's). As W.J. Johnson, Wendy has authored a best-selling book on spinning, dyeing, and knitting yarn (Yarn Works: How to spin, dye, and knit your own yarn, pub. Quarto Publishing – Creative Publishing international, 2014). Wendy is currently writing a book about design legibility that is a compilation of her research on good design for the aging eye. Wendy lives with her husband and two border collies in a home that she designed using aging-friendly concepts and ecologically-conscious materials.